Wool (shorn or pulled from the coats of sheep) is probably one of the oldest materials known to man. In its earliest form it is likely to have been felted: made by pressing and pounding the damp fibres together until they compressed and matted easily. It will occur naturally and randomly when wool is left together in a bag – as I have found. Felt has the advantage of being wind and weatherproof and does not easily fray. Evidence of woollen fabric survives from the Bronze Age in fragments found in tombs in Denmark. The material produced by the upright drop weighted looms was probably fairly coarse, but by Roman times dyed woollen cloth made by the tribes settled in England and Gaul was prized in Roman markets. By the early Middle Ages much of England’s wealth came from the high quality wool produced throughout the Southern half of the kingdom. Churches were built on donations from wealthy merchants who wished to be remembered (and safe from hell in their afterlife) and the seat of the Chancellor, the woolsack, originates from this period. By the sixteenth century there was a vast range of wool based fabrics from which to choose. By varying the composition of the warp (the long thread running the length of the fabric) and the weft (the horizontal thread) a wide choice of fabrics which were hard wearing, resilient, cheaper or more luxurious became available. These included BAYS – a napped fabric with a worsted warp for strength and woollen weft, SCARLET – a high quality deep dyed cloth where the dye itself was a major expense. According to the Hardwick inventory, Bess of Hardwicke paid more for some of this cloth than for an equivalent amount of silk velvet. Amongst the middle quality furnishing wools there was PENISTONE, a coarse cloth from that area of Yorkshire which was sometimes napped and felted, and MOCKADO which was woven with a short pile to the fabric. 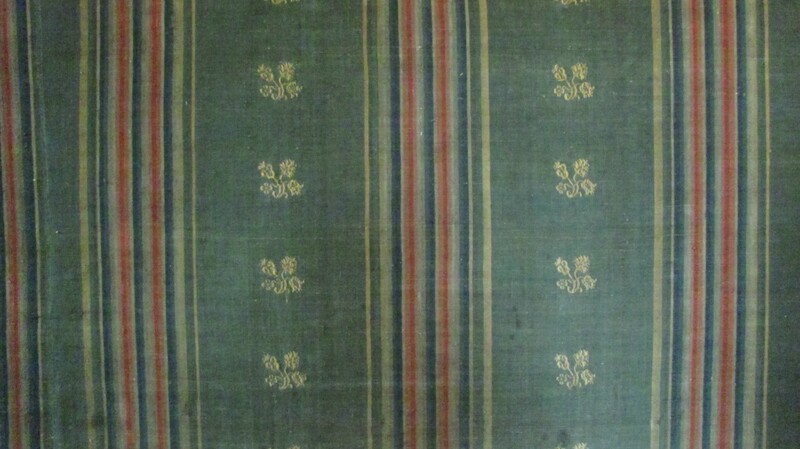 This originally imitated silk velvet, and was available both in a plain form with the pile, and voided (where areas of the pile were removed to highlight a pattern). Originally quite popular amongst the middle classes and country gentry, it finally became used as a term of mockery for something that was tawdry or second rate. Later during the eighteenth century it reappeared to describe a type of carpet. There were also cloths which combined wool and linen, such as DARNIX (also known as dornix). The problem for us today is that these middle quality fabrics were not the ones that were treasured and reused. When they became shabby they were replaced. However, Chastleton House in Gloucestershire (in the care of the National Trust) has a rare surviving piece of dornix on display. The piece is some eight feet square and in good enough condition to see the depth of its original 10 colours as well as the way the weft thread passes under the warp to enable a repeated raised embroidery effect*. There was also FUSTIAN, which more usually was a combination of linen with cotton and was originally imported from Fustat in Egypt, but was subsequently made around the Midlands and incorporated wool to produce a coarse blanket material, sometimes used as interlining in quilts. FLEDGE was a similar coarse blanket material, suitable for servants. By the sixteenth century the finest quality blankets were being imported from Spain and England had lost her ealier dominance of Europe. 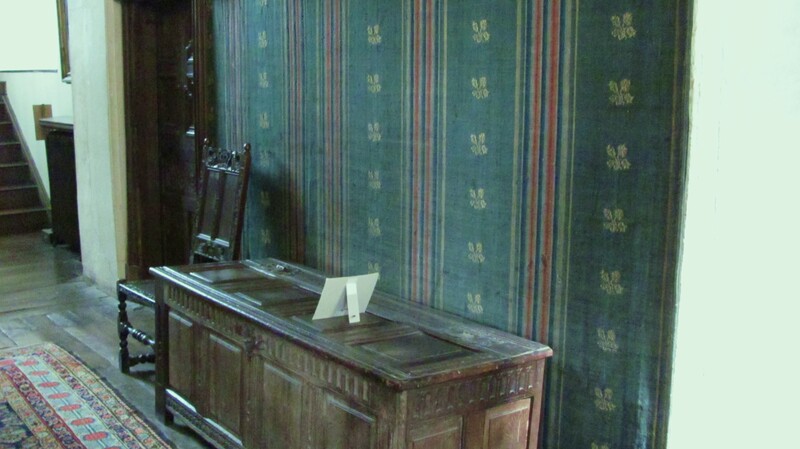 (‘An Elizabethan Inheritance – The Hardwick Hall Textiles’ by Santina M. Levey) Inventories such as those at Hardwick and the earlier medieval letters of the Paston family help to tell us the range available in different periods. Sumptuary laws were passed irregularly throughout the Middle Ages and Tudor period in an attempt to regulate both the quantity and quality of fabric that a particular class could enjoy wearing, and which were on occasion designed also to help protect the woollen industry. Queen Elizabeth I required her subjects to wear woollen caps in order to maintain wool’s profitability in the face of foreign imports form Spain and The Netherlands. However, because they were virtually impossible to police, clothing restrictions were never very successful and the last ones in this country were passed by King Charles II who required people to be buried in woollen shrouds. This article on wool has become very popular, with requests for more details. I have just been reading ‘The Tudor Tailor’ by Ninya Mikhaila and Jane Malcolm-Davies, published by the Batsford Press (2006). Quite apart from enabling the reader to construct a complete 16th century outfit, these ladies have compiled a detailed list of fabrics available in the Tudor period, along with definitions and at least one primary source for their authority. So for those readers who want to know their sarcenet from their stammel, their russells from their russet, I commend the table on pages 36 -37 of the book.